The Georgia State Panthers cheer on their teammates as they compete against the University of Mississippi on March 14, 2018. 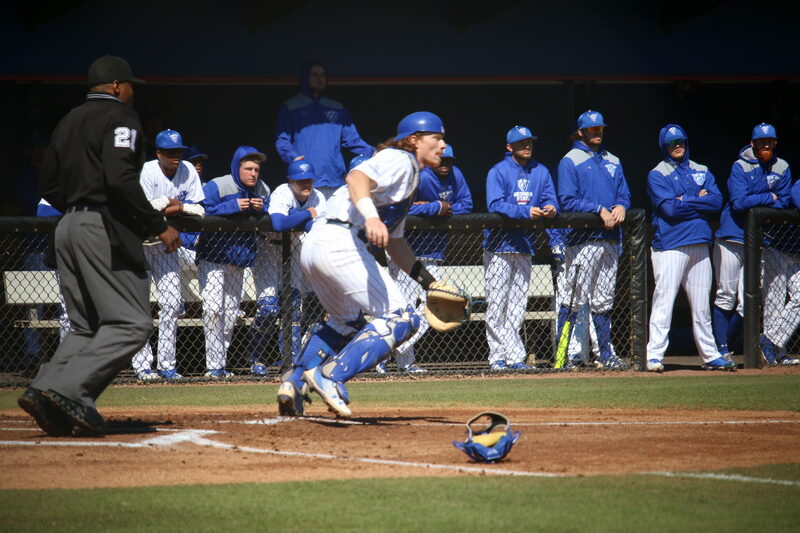 Georgia State (12-11) suffered a tough 15-9 loss to Kennesaw State (12-12) on Tuesday’s matchup at GSU Baseball Complex. Kennesaw State scored seven runs in the seventh inning that put the game out of reach after a fourth inning rally by the Panthers. Georgia State has now lost eight of their last nine games after splitting games with South Alabama last weekend. Senior pitcher Tanner Thompson gave up seven runs to give Kennesaw State a quick 8-2 lead in the fourth inning. The Panthers began staging their comeback in the bottom of the fourth, sparked by a three-run triple from freshman Kalen Puckett. This was followed up by an RBI from catcher Nick Gatewood that brought the score to 8-7. Georgia State’s momentum was then halted when an error lead to two scores from the Owls at the top of the seventh. Another error and five more runs resulted in a 15-7 deficit for the Panthers going into the seventh inning stretch. A late game two-run homer from Luke Leonard gave the Panthers a quality ninth inning which helped gain much needed momentum for the Panthers before heading into a tough series with Troy. Georgia State struggled all night on the defensive end, but head coach Greg Frady applauded his team’s resilience in their fight to the end. He also spoke highly of freshmen Kalen Puckett and Joah Curry. Curry recorded two strikeouts on three batters in the eighth inning to retire the Panthers and Puckett finished with four RBIs. The Panthers head into their conference series with Troy (17-8) on Thursday March 29.